Leadville, a Victorian-era mining town, was once home to 30,000 residents. In its heyday, it saloons, dance halls, and brothels. Thanks to the profiting gold and silver mines, there was also a lot of wealth, which afforded the construction of hotels, Victorian mansions, and the Tabor Opera House. 70 square blocks of Leadville’s downtown were designated a National Historic Landmark in 1966. Since then, extensive preservation efforts have put much of the town’s rich history on display. With such notable structures as the Healy House, Heritage Museum, Delaware Hotel, and Tabor Home on the route, a historic walking tour of downtown Leadville is not to be missed. You will be starting your walk at the Ice Palace Park in the 100 block of West 10th were ample parking is available. Opening on January 3, 1896, the world’s largest palace of ice was built in Leadville. It contained a skating rink, grand ballroom, restaurant and exhibition halls. It lasted only a few short months, closing in May of 1896. This park commemorates the famed Ice Palace which was built just a few blocks away. The large lake you see in the distance to the northwest is Turquoise Lake--another beautiful place to take a walk. Walk southeast from the parking lot to Harrison Avenue. The three story house on the southeast corner of Harrison and Tenth is the Healy House. Originally a two-story structure, the Healy House was built in 1878 by August R. Meyer, a mining engineer from St. Louis who established the first ore sampling works in Leadville. Sold in 1881, the house eventually became the property of Daniel Healy, who leased it as a boardinghouse from 1897 to 1902. In 1898 a third story was added to accommodate more boarders, most of them schoolteachers. The Dexter Cabin, an exclusive poker club for wealthy gentlemen, sits next door to the Healy House. The Healy House and Dexter Cabin are public museums operated by the Colorado Historical Society during the summer months. Learn more about the Dexter Cabin and Healy House Museum. Turn right (south on Harrison Avenue) and begin your tour down Leadville’s main street walking on the south side of the street in front of the Healy House. The brick building at the northeast corner of Harrison and 9th is the Heritage Museum. Built as the Carnegie Library, it opened in 1904, two years after the cornerstone date of 1902. It served as the library for the area until 1971 when it was turned into a local museum. It is open during the summer months and houses a scale model of the Leadville Ice Palace, an excellent display of 10th Mountain Division memorabilia and various Leadville artifacts. 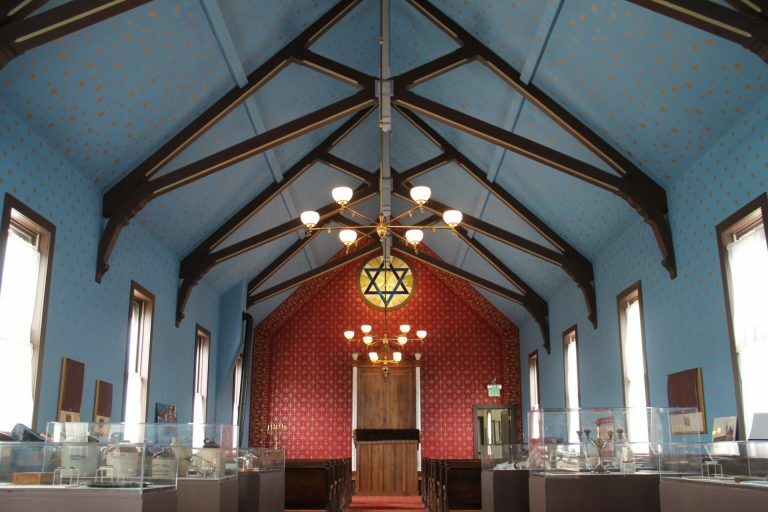 Learn more about Leadville's Heritage Museum. Look west on 9th. The large red brick building at 120 West 9th houses the Federally Chartered National Mining Hall of Fame and Museum. The building was originally the Leadville High School built in 1900. The museum is open daily. We encourage you to visit it. Learn more about the National Mining Hall of Fame and Museum. Be careful crossing the intersection! At the northeast corner of West 8th and Harrison is Leadville City Hall. Built in 1905 as a federal building, it was used as the US Post Office until 1973. As the story goes, the postmaster used the small attic windows to spy on his employees as they delivered mail around town. Note the plaque on the front of the building which denotes fallen lawmen. On display in the lobby is an antique Leadville popcorn wagon. You are welcome to step inside this building. At the northeast corner of West 7th and Harrison Avenue sits the Delaware Hotel Block. Opening in October of 1886, the Delaware Block cost an estimated $60,000 and is named in honor of the home state of the three brothers who built it. A few years after the building was built, the entire lower floor became a dry goods store, Crews-Beggs. It operated here until 1980. Undergoing extensive renovation in 1992, the entire building is now the Delaware Hotel with two restaurants. Look up East 7th Street to the church with the tall spire. Annunciation Church sits on the southwest corner of Poplar and East 7th. Started in 1879, the church was dedicated on New Year’s Day, 1880. The steeple is a masterpiece of intricate carpentry, a web-like interweaving of timbers built to last for centuries. A great bell which weighs 3,026 pounds is 11,000 feet above sea level. It is called “St. Mary” and was installed in 1885. The church and rectory cost $40,000. 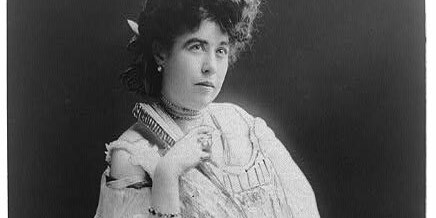 The prominent “Unsinkable Molly Brown” was married in the church on September 1, 1886, and the funeral services for Baby Doe Tabor were held here in 1935. In every photo of Leadville, the spire is a directional landmark. The church is generally unlocked and you are welcome to visit being careful not to interrupt any services which may be taking place. Continue your tour by walking south on Harrison Avenue. Located on the southeast corner of 6th and Harrison is the Iron Building with a corner pediment with the name of Fearnley. It was built in 1893 amidst the collapse of the silver market. It is thought the name “Iron Building” either comes from the use of iron on the building or from the fact that the humble iron ore found in the Leadville mining district might be a saving grace after the fall of silver. The Tabor Home was built by H. A. W. Tabor about 1877 at 512 Harrison Avenue and moved to its present location at 116 E. 5th in 1879. Property on Harrison Avenue had become too valuable for residence lots and needed to be occupied by blocks of business. Horace and Augusta maintained their Leadville home until 1881 when Tabor moved to the Windsor Hotel to be close to his latest mistress, "Baby Doe". The Tabor triangle grew into a national scandal and finally ended in divorce and Tabor's marriage to "Baby Doe". The public was in support of Augusta and Tabor never regained his former prestige. Augusta, Leadville's "First Lady", was a remarkable person. She had great courage, super human endurance and unusual business acumen. A dozen years after the sensational divorce which broke her heart, she died a millionaire. In that very same year, Horace A. W. Tabor was bankrupt. The Tabor Home; 116 East 5th Street; Leadville, CO; 80461. Open Memorial Day to Labor Day. Learn more about the Original Tabor Home. Located on the southeast corner of 5th and Harrison is the three story brick and sandstone bank building built in the Romanesque style. The building is 25 feet wide and 110 feet deep with a 17 foot tower of red sandstone. The corner tower is topped with a bell shaped metal painted dome. The building’s first occupant in 1892 was the American National Bank. The southeast corner of 4th and Harrison is currently the Scarlet Lounge. The building was built in 1887 as the Breene Block named from Lt. Governor and State Treasurer of Colorado, Peter W. Breene, who provided the funding. Initially the first floor was occupied by Adolph Hirsch’s liquor store which did probably the largest volume of business in Western Colorado. His sales amounted to nearly $300,000 and his freight bill was $60,000 in 1888! Two historic buildings on this side of the street in the middle of the 300 block of Harrison just can’t go without mention! The Hyman Block, built between 1885 and 1890 is where Doc Holliday shot (but did not kill) his last man! Next door is the famous Tabor Opera House. Opening on November 20, 1879, the Tabor Opera House is one of only a few “Tabor” associated building still standing in Colorado. Tabor was a shopkeeper who grubstaked a couple of miners who struck it rich. He became wealthy overnight. The divorce of his first wife, Augusta, and marriage to the beautiful Baby Doe is the well-known story of the Tabor Triangle. The Opera House was said to be the finest theater between St. Louis and San Francisco when it was built. It is open for tours during the summer months. Learn more about the Tabor Opera House. Cross Harrison Avenue at 3rd, using caution and the crosswalk, to return up the other side of Harrison going north. The saloon in the middle of this block is one of Leadville’s oldest establishments. Opening in 1883 in the Clipper Building, it was originally the Board of Trade Saloon. It has been the Silver Dollar since 1935. The majestic antique back bar made by the Brunswick Company and the original tile floor remain in use today. As you cross 4th Street, look to the west. St. George’s Episcopal Church is located on the northwest corner of 5th and Pine. The church was built as a small replica of St. George’s Church in New York City. The cornerstone was laid September 15, 1880. The architectural features include hand-hewn beams and gothic arches of native timber, plaster walls, and unusual “tinted glass” windows. The windows were created using the technique of painting clear glass and glazing in a furnace. On the southwest corner of 5th and Harrison sits the Western Hardware Building. It was opened in August of 1881 as the Manville and McCarthy Hardware. The store operated as a hardware store for over 100 years. It remains a perfect intact example of 19th century commercial architecture. A corner entrance with tall doors leads you inside where many of the original store fixtures including a long counter and wall of drawers are on display. Continue walking on Harrison Avenue. The building on your left is the Lake County Courthouse. 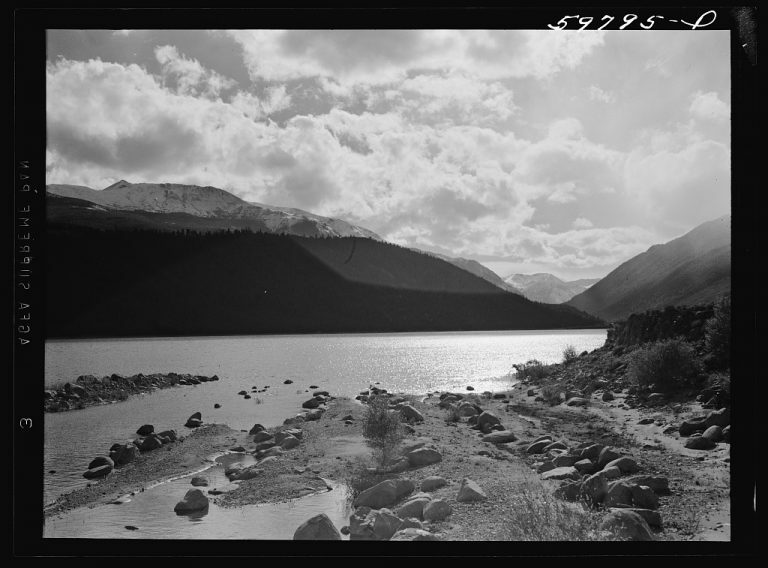 Built in 1955, Leadville received the All-America City award from Look magazine in 1958 for being progressive! This building contributed to this status! The original courthouse was built in the middle of this block in 1880, partially burned in 1942 and was removed after the new courthouse was built. The building on the northwest corner of Harrison and 6th Street is an original 1897 clapboard commercial structure. Opened as a drug store and saloon, it was later know as Davis Drug from 1902 until 1943. On the northwest corner of 7th and Harrison, sits the Tabor Grand Hotel building. Built during the two year period of 1883 to 1885, this four story brick building was designed by noted architect of the period, George King. The hotel has had many names including the Maxwell, the Kitchen, and the Vendome. The newspaper of the day carried the following quote when the Hotel opened: “Leadville now has a hotel which in elegance of its appointments is second to none in the west and in which citizens and tourists will find all the luxuries and conveniences of the older cities.” The building was renovated and re-opened in 1992 with shops on the lower floor and apartments on the upper floors. On the northwest corner of 8th and Harrison sits the Presbyterian Church, affectionately called “The Old Church” by locals. With its open Gothic-styled belltower, the church has been a landmark on Harrison Avenue since its impressive dedication ceremonies on December 22 of 1889. the decorative glass sections of the windows are of various types, the most common being hand-painted glass of the Persian technique. This is the last stop on the Leadville Historic Walking Tour. We hope you enjoyed your walk!